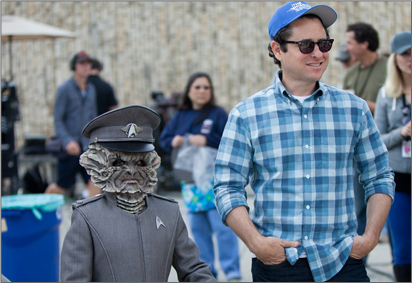 Live Long (Dress Well) and Prosper. June 3, 2013. Into Dorkness, more like it. I got to see the long awaited Star Trek: Into Darkness this weekend and not only thoroughly enjoyed the movie itself (Trekkies, argue all you want-it delivered wholly on an entertainment level, even if it didn’t entirely follow precious plot lines). While Gene Roddenberry’s technology driven future flashed across the screen with the signature JJ Abrams light flares, many movie-goers may have been focused on the slightly altered communicators or Chris Pine’s corn-fed face. I, however, was enthralled with the wardrobe. Not normally overly interested in fashion or wardrobe when it comes to films (or in real life, for that matter), I was surprised at how much the costumes caught my attention. Spoilers ahead, I guess? 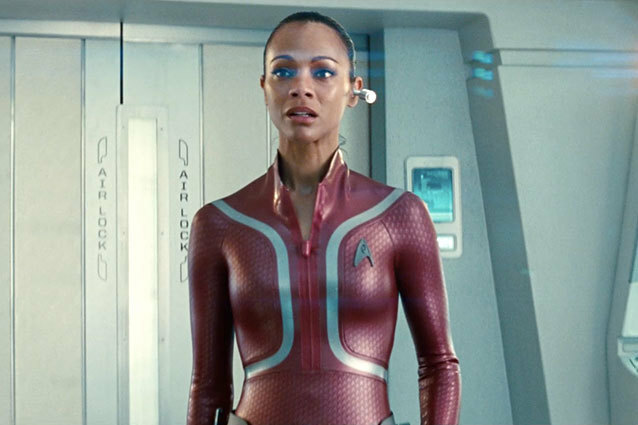 In Abrams first Star Trek, the costume designer updated the Starfleet’s uniforms from the decades used, blasé multicolored uniforms with the only real difference between the men and women’s options being the thigh grazing dresses which would make any combat a total peep show. Michael Kaplan, Into Darkness’ wardrobe genius, brought the costumes onto a whole new level and while no costume was extreme to the point of being strident, the changes in Into Darkness were subtle and perfect hints at the time that had passed between the first installment. A return to the sixties was hinted at with many color schemes and cuts, but overall the sense of futuristic wear was weaved in carefully with current styles that even now we’re seeing on the runway at Viktor & Rolf and Alexander Wang. While I enjoyed all of the outfitting from Into Darkness, there were a few ensembles that stood out in particular. All wetsuits (Spock’s, Kirk’s, and Uhura’s) were emblazoned with tiny Starfleet emblems, creating a pattern across the fabric- this detail was subtle enough that I almost didn’t notice. I liked the overall look and feel of the wetsuits, which bring to mind Balenciaga’s Spring/Summer 2013 neoprene line. When preparing for flight, officers wore grey shuttlesuits with see through panels on the breastbone, showing the color of their uniform underneath; a slight detail, but a fun addition to the texturized grey. Sharp and tailored and making me wish I could join the academy just so I could look that polished every day. Pike looked the slickest in a thick mock turtle neck getup, primarily grey with cream accents and plenty decorated. 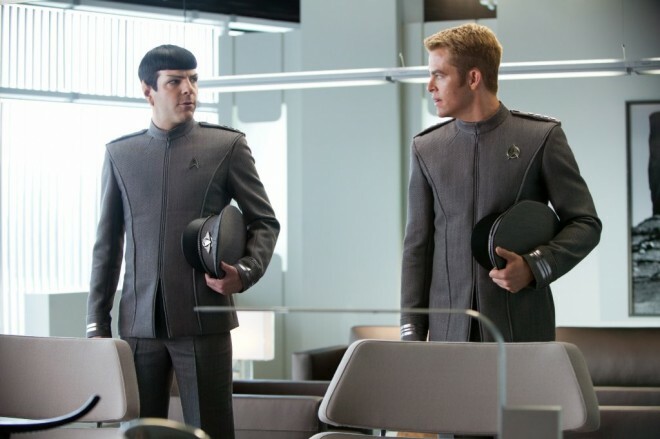 I remember specifically noting how much I liked the cut and style when watching the film, the uniform looked almost…cozy. I guess that’s what you get when you’re stuck in tank top and chiffon shirt purgatory Southeast Asia. I wish I could have found a better picture of Pike’s specific uniform, but you get the overall feel of the officer’s attire in these photos. From the moment Khan lured the grieving Starfleet employee into his plan for vengeance to him smashing Klingons left and right to his conscious ending fight with Spock (who finally gets in touch with his literal human side); he’s got that whole badass in black thing going on. 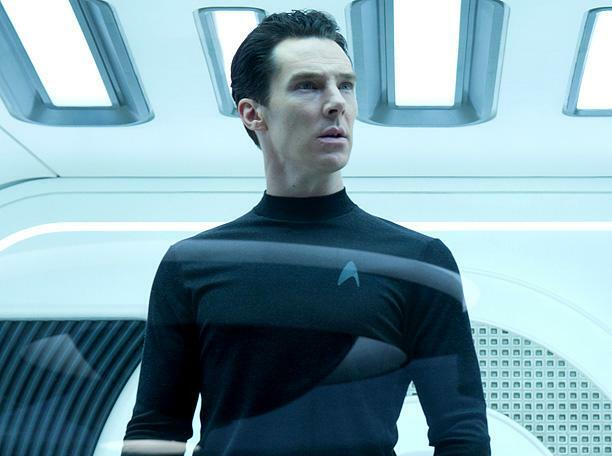 Kaplan on Khan’s wardrobe said “I wanted him to be kind of enigmatic, but also very well-dressed.” In high necked trench coats, underarmor-esque prison wear, and layered and caped intergalactic wear- it looks like Kaplan hit the nail on the head. → Rockabilly. June 4, 2013. ← The white idiot writhes on his chair, begging for cheeseburgers.